Do tooth fairies have teeth? Being 9 years old, Rachel is beyond such things as Tooth Fairies. Winie the Pooh and Tigger are where they have always been waiting for the next child to come along. Tigger and Pooh are stuck in the Hundred Acre Wood forever, but there’s no going back for Rachel, or the rest of us for that matter; what a pity. This is a revised piece but never been published here before. ‘Will the Tooth Fairy find me in Melbourne, Nanna? Rachel is a Sydney girl who pays regular visits to her Melbourne grandparents. Her questions come thick and fast the moment she steps off the tarmac at Melbourne Airport and are usually more demanding; they can range from how do aeroplanes stay up in the air to how many lollies can you fit in your mouth? Rachel’s front tooth was hanging by a thread and was causing her a fair bit of mental agony. I could see the cogs whirring and the questions forming. Thankfully the tooth fairy and I had done business before so were well acquainted. This time round I had all the answers to Rachel’s questions. I breathed a sigh of relief and got on with the necessary explanations. ‘Sure she will find you, honey.’ I said. 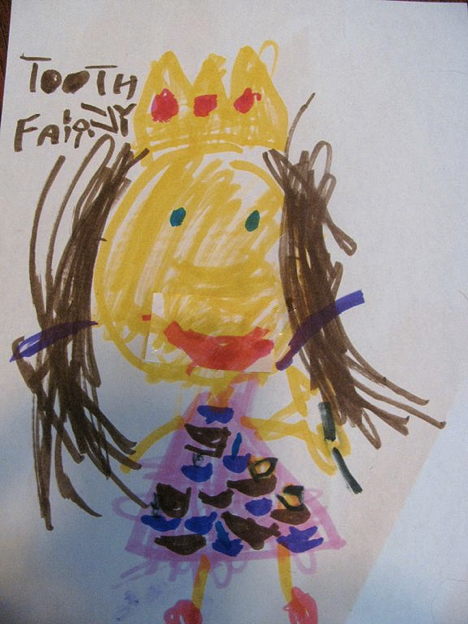 ‘Tooth Fairies have antennas.’ They are like little divining rods that lead them to wherever the teeth are. And not only was there a Melbourne Tooth Fairy, I explained, there were hordes of them plying their trade worldwide and hauling their stash to their corner of Fairyland each night. When we got home, I gave her the traditional apple to help things along. I mused that growing those teeth had taken up a third of Rachel’s life and caused many sleepless nights for all concerned, now she was happy to shed them without a backward glance. She munched and then we spent an exciting afternoon checking out the unattractive object of the Tooth Fairy’s desire. And where was Fairyland? For those of you not in the know, Fairyland is up Enid Blyton’s Far Away Tree. If you are lucky enough to find that tree it is right up the top, where a different and ever more exotic country lands each day. Rachel and I spent a pleasant afternoon discussing the most effective place to put her tooth. We checked out and rejected several locations, including under the pillow: too easily lost and the mantelpiece in the lounge room. How would the Tooth Fairy know who it belonged to? We finally settled on dropping it into a glass of water and putting it on Rachel’s bedside table. Ten year old Dezzy, Rachel’s sister, was at the other end of the room during this discussion, busying herself with something arty-crafty. She had her head bent low throughout it all but I could tell she was listening. She had long since extracted the last dollar from the tooth fairy, but being the nice child that she is, she wasn’t about to spoil it for her sister. Dezzy just smiled and kept her counsel. ‘Tooth Fairies are shy, Rachel, yours won’t turn up until you’re asleep.’ It had been an interesting and exhausting afternoon, but Rachel wasn’t quite done yet. She clutched her tooth to her, Rachel had a request. Very cute and I love the picture! Hope to see more pictures! Well, you know how I feel about pictures. But I have been trying.